I created this P.E.E.L. kit to help struggling writers remember how to structure an essay. I had students with a variety of needs so I created different versions of this to address those needs. You don’t have to use everything here- use what your student needs. This page can be made into a poster to hang in the room or given to the student as a reminder of body paragraph structure. The body paragraph should make a point that supports the thesis statement (break the thesis statement up into points that can be assigned to each body paragraph). Provide evidence that proves the point. Explain how your evidence proves the point. Link this point to the next one with a transition sentence. This is a common acronym to help students remember this structure. The points are usually covered in order of importance, depending on the topic. Most of my students were able to produce this paragraph structure using this graphic organizer. Listing the PEEL at the top gives a reminder of what the paragraph should include and what order it should follow. I provide a model that can be shown or given to students. Some of my struggling writers still had trouble incorporating all the elements of PEEL and needed a graphic organizer to help them accomplish each part of the paragraph. This handout helps with that. Each component has it’s own box and a reminder of what they should do. These students can fill this out and show it to the teacher or a peer for feedback. From there they can combine it into one paragraph on the above graphic organizer to see how it fits together. I also included a model for this graphic organizer. That’s all you need if your students just struggle with the body paragraphs. However, if they also struggle with introductions and conclusions I have handouts that help with that too. 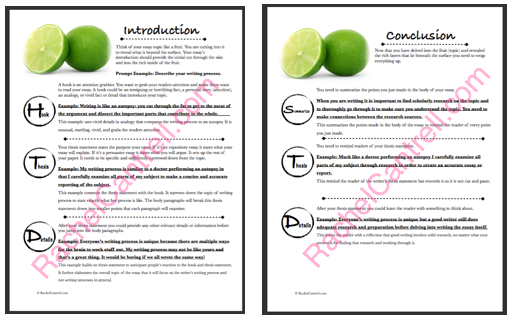 These handouts explain the different elements found in an introduction and a conclusion. I created an outline that can also be used for struggling writers to help them outline their entire essay. This may not be necessary for all students. I found my advance students just needed the PEEL organizer and could the introduction and conclusion without the full outline. My struggling and reluctant writers needed this outline to keep them on track and in order. 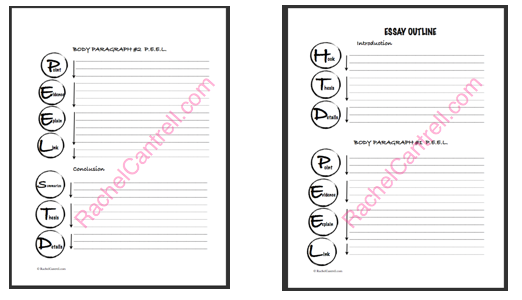 In addition to these graphic organizers I also included two handouts that discuss the components of a persuasive essay versus an expository essay. 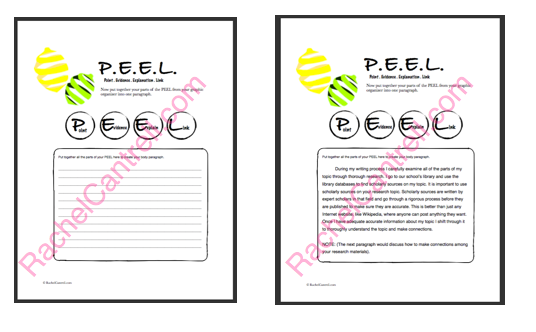 These can be used to help you teach or they can be given to more advanced students instead of the above outline. My advance students preferred the outline explanation below rather than the graphic organizer above. However, it was the opposite for my struggling or reluctant writers- they preferred the outline above. I also include a list of possible topics for both types of essays to give you assignment ideas. They are full size pages. For this post I took screenshots, added my website tag in pink, and shrunk it down to fit the post. The actual product is high quality and full normal printer paper size. Tagged graphic organizers, TPT, writing.